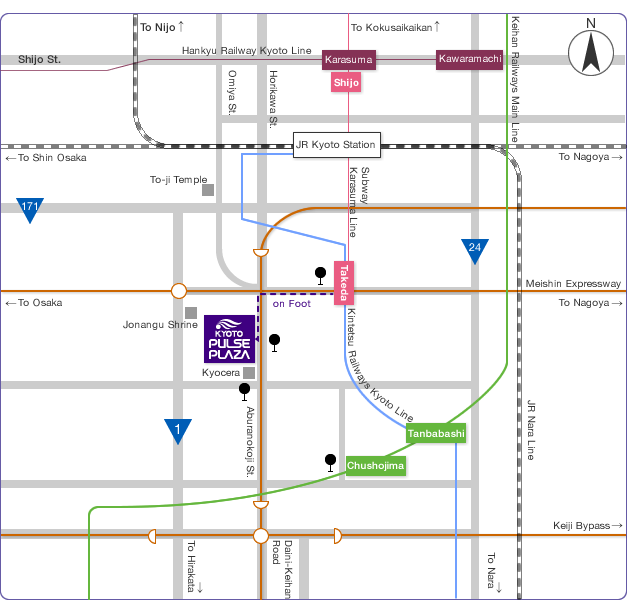 Take City or Keihan Bus from Takeda Station West Exit No.4 to "Pulse Plazamae". Take City or Keihan Bus from Chushojima Station North Exit to "Pulse Plazamae". Take R'ex Bus（Express Bus） from Kyoto Station Hachijo Exit to "Kyoto Pulse Plaza/Kyoseramae". About 75 minutes by Airport Express "HARUKA", or about 85 minutes by Limousine Bus. About 55 minutes by Limousine Bus . kyoto pulse plaza all rights reserved.